Fernox F1 Protector Express 265ml gives long term protection of domestic central heating systems against internal corrosion and limescale formation. It prevents corrosion of all metals found in these systems, i.e. ferrous metals, copper and copper alloys and aluminium. 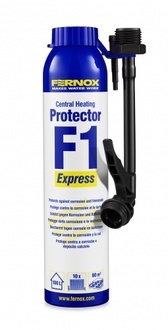 Have you seen 'Fernox F1 Protector Express 265ml (Fernox )' cheaper than our price (ex VAT) of £16.50 elsewhere?